Although Apple has yet to officially release iPhone Software v2.0, readers have discovered an active download link that will allow you to manually download and then install the update on your current iPhone ahead of time. Included is a step-by-step guide on how to update your iPhone using the file download. AppleInsider reader Jared notes that the new software can be obtained from this link [225MB]. The build number of the software is "5A347," slightly newer than build "5A345" that was discovered to be running on iPhone demo units that began making their way to Apple and AT&T retail stores a bit earlier in the week. If you download the software from the above link, you will need to manually tell iTunes to use the file that that you just downloaded, as iTunes will be unaware of its location on your hard drive. To do this, select your iPhone in iTunes to bring up the iPhone summary tab, then simply hold down the "option" key on your Mac or PC while selecting the "Check for Update" button. Then select the "iPhone1,2_2.0_5A347_Restore.ipsw" file from your hard drive. 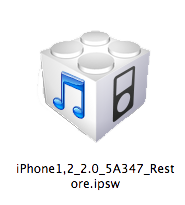 For most users, the file will download as a "iPhone1,2_2.0_5A347_Restore.ipsw.zip". In this case, you must rename the file to "iPhone1,2_2.0_5A347_Restore.ipsw" by deleting the ".zip" from the file name, but do not unzip the file yourself. (iTunes will unzip the file once you select it.) After you rename the file, if everything went right, its icon should change to a lego-looking iTunes installer module (below) and you can then select it in iTunes as described above. AppleInsider forum member irnchriz notes that if you download the software using a Mac, Safari automatically extracts the zip file and puts the original zip file in the trash. If this is the case, drag the "iPhone1,2_2.0_5A347_Restore.ipsw.zip" file from the trash and remove the ".zip" file extension from the file name as mentioned above. You can then select the file in iTunes as mentioned above. Before updating, however, it's imperative that you review Apple's support document on Updating and restoring iPhone and iPod touch software. Apple notes that: Normally if you choose to update, the iPhone or iPod touch software is updated but your settings and media are not affected. If your device currently has a software version prior to 2.0 (1.x) and you are updating to software version 2.0 or later, all data on your device will be erased in order to perform install the new software. In this case, iTunes will offer to create a one-time media backup of your device depending on what content is on your device and what content is stored in the iTunes Library you are connected to. You should ensure that you have enough free space on your Mac or PC to accommodate a backup that matches the capacity of your iPhone or iPod touch (4 GB, 8 GB, 16 GB, or 32 GB) if you proceed with the this backup." "If you choose to restore, all data is erased from iPhone or iPod touch, including songs, videos, contacts, photos, calendar information, and any other data. All iPhone or iPod touch settings are restored to their factory condition. Whenever you update or restore your iPhone or iPod touch software, Apple highly recommends that you perform a sync prior to the update in order to back up any changes since your last sync. If you have movie rentals on the device, see this document before restoring." After you update your iPhone with iPhone Software 2.0, which takes about 10 minutes, the iPhone will restart and disappear from iTunes. For about 10-20 seconds it will appear as if your iPhone is inactive or bricked. Don't panic. Wait 10 seconds and it should re-appear in iTunes and reactivate itself. At this point, iTunes should display a dialog like the one below, asking if you'd now like to restore all the information that was on your iPhone before iPhone Software 2.0 wiped it clean to perform the install. The restore process will take several minutes, at least, depending on how much content you had on your iPhone. Once iTunes has performed the data restore, you should see a dialog box appear like the one below. After that, iTunes will sync back the media files from your iTunes library. Your iPhone is then good to go with the new version of iPhone Software. Note: When updating to iPhone Software 2.0 via the file downloaded link provided above, iTunes did not ask to perform a data backup prior to installation as Apple's support document suggested. Instead, it performed a backup automatically without prompting. Apple has also released iPhone Configuration Web Utility 1.0 for Mac OS X and Windows. iPhone Configuration Web Utility lets you easily create, sign and distribute configuration profiles using a web browser. For instructions on how to use iPhone Configuration Web Utility, see the iPhone and iPod touch Enterprise Deployment Guide. The version of iPhone Software v2.0 linked in this article cannot be installed on an iPod touch. Apple will charge iPod touch users a $10 upgrade fee for the software. iPod touch users should be able to officially upgrade sometime later today. If restoring with the most recent version of iTunes does not work, Apple recommends reading this support document. A complete rundown of features in iPhone Software 2.0 were covered previously.